After slipping on ice outside the home of an upper crust Ohio couple (Billie Burke and Grant Mitchell), curmudgeonly literary critic Sheridan Whiteside (Monty Woolley) commandeers their house as a recovery station. Meanwhile, his secretary (Bette Davis) falls in love with a local newspaperman (Richard Travis), and Whiteside — worried about losing his loyal employee to marriage — calls on the help of his seductive actress-friend (Ann Sheridan) to interfere. 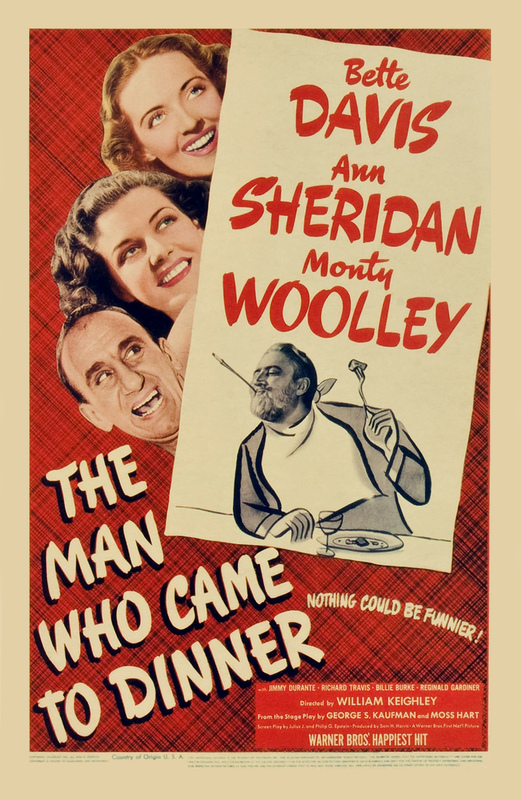 Monty Woolley — a.k.a. “The Beard” — gave his signature performance in this adaptation of Moss Hart and George S. Kaufman’s madcap ensemble play, co-starring a subdued Bette Davis (who had originally hoped to perform opposite John Barrymore), and a deliciously self-absorbed Ann Sheridan. Unfortunately, the script has dated over the years, with too many references to contemporary celebrities, and an annoying cameo appearance by Jimmy Durante (who inexplicably starts playing the piano and singing, “Did you ever have the feeling that you wanted to go, and still have the feeling that you wanted to stay?”). Most egregiously, however, it features a lead protagonist who’s simply too nasty for comfort: not only is Whiteside litigation-happy (he immediately threatens to sue his gracious guests for $150,000 dollars), but he’s constantly making mean-spirited comments (“My great-aunt Jennifer ate a whole box of candy every day of her life; she lived to be 102, and when she had been dead three days, she looked better than you do now”). Unlike Noel Coward’s ruthless publisher in The Scoundrel (1935) — who eventually gets his come-uppance — Whiteside is, inexplicably, beloved by many; ultimately, it’s hard to root for someone so irredeemably obnoxious. No, though it’s recommended simply to see Woolley in his most definitive role. Is it really supposed to be so hilarious that Whiteside is such an a~hole? He gets only one inspired line (“You have the touch of a love-starved cobra.”), but mostly he’s just not funny. Neither is the film. Is this really the play? Or has all the ‘zany’ Kaufman & Hart material simply lost whatever ‘punch’ it had? Thirty minutes in, ‘Man…’ wears out its tenuous welcome – except for Davis – and the last 1/2-hour is forced and tiresome. The one comedic sequence that works – thanks largely to Reginald Gardiner as Beverly Carlton – is how Davis manages to get Sheridan out of town. Admittedly, Davis shines in an atypical role, one she keeps from being thankless. (‘Interesting’ to see this right after watching M. Streep in ‘Still of the Night’ – another example of cast-against-type. Streep meant it when she talked on TCM about exactly how much she learned from Davis’ work.) That said, the film is too tedious to recommend for Davis alone (or the odd touch: Sheridan out-Hayworthing Hayworth; Wickes being befuddled, and getting a nice exit line). Near the end of the film, Woolley cries out, “Great heavens, will this drivel never stop? My head is bursting!” Couldn’t have said it better myself.